When the poncho craze hit a number of years ago, like a lot of knitters, I hopped on the bandwagon and made a few, but I was never really happy with the triangular shape with the points hanging down the middle. What I really wanted was a shawl/cape, but preferably one that was long enough to cover my bum, for warmth, as well as a little vanity. 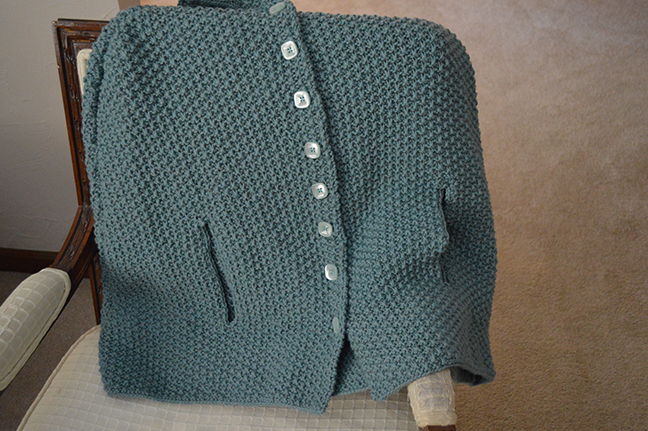 I also wanted it to work with some yarn I inherited that I knew wasn’t quite enough to make a complete sweater. After doing some digging online a few years ago, I found this pattern from the Bernat Handicrafter Book No. 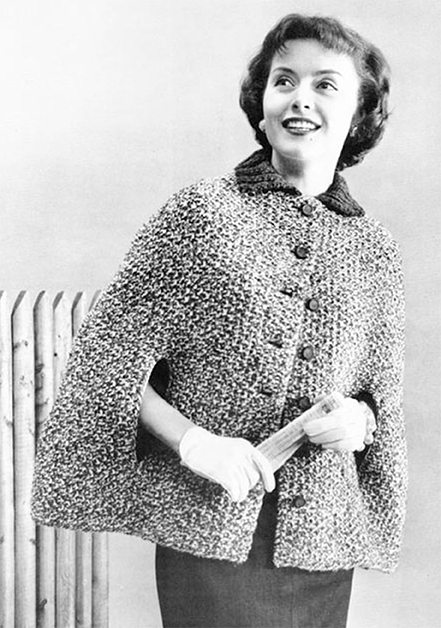 58, “Fast and Fun to Knit Bulkies,” from 1956. Isn’t it just darling? It’s also quick, due to the large gauge (9 stitches = 2 inches), and the pattern is a basic slip stitch that couldn’t be easier. 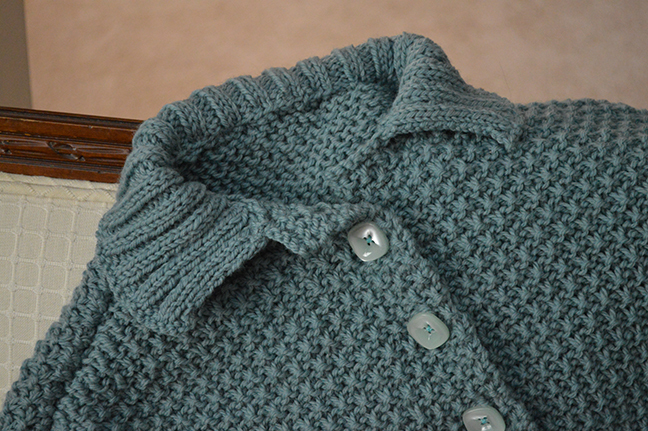 I made the buttonholes a stitch smaller than the pattern suggested, since I knew they’d stretch a bit. I also didn’t face the front edges with ribbon as the pattern said to do since it didn’t seem necessary. Now that I have my stylish new cape, I am ready for fall, my favorite season! I love it Sandra Louise! Makes me want to knit again. 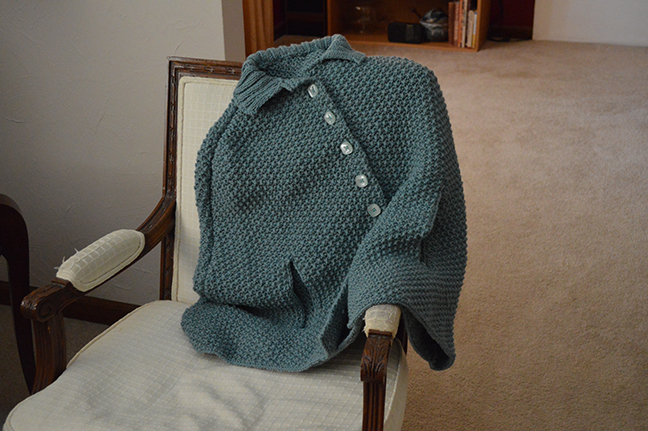 I have quite a few knitted ponchos tucked away in my closet, too. But this capelet deserves to be worn every day this fall! Beautiful job! Awww, thanks Steph! Believe it or not, the worst part was seaming the pieces together. I’m not totally happy with how that part turned out but I’m embracing done rather than perfect. This is fantastic. 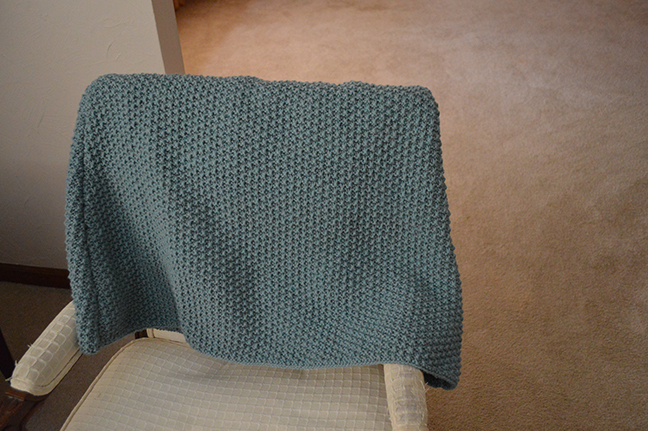 I really love the shape of it, and the moss stitch is total perfection. It looks like it will keep you warm! Thanks, Erin. Maybe if it’s cools off enough I can wear it to our next guild meeting. But I’m not complaining about a few extra warm days! That’s perfect! I like the shape and the color is so appealing–sort of a neutral, but with personality!